We have all been told that eating fish is good for you and equally, that eating red meat is bad. But is this true? And if so, why? This has been the subject of much research over the past 60 years. Two recent papers, one about the benefits of fish oils and the other about the reasons why red meat might be bad for you, have helped shed more light on the matter. Taking fish oils has long been thought to provide numerous health benefits but the overall effect has been complicated by inconsistent results from clinical trials. There are many reasons for this, but the main two surround the complexity of how the active components in fish oil bring about their benefits and also the question of exactly how much fish oil a person needs to consume before seeing benefits. Fish oils are thought to have an effect in lowering triglyceride levels in the blood. Triglycerides are a type of fat whose elevated levels in the body are frequently observed in obese people. Triglycerides represent an important risk factor for the development of cardiovascular disease. So much so, that the recent National Vascular Disease Prevention Alliance guidelines for management of cardiovascular disease recommend that blood triglyceride levels should be below a certain concentration (two milligrams per deciliter). Other experts have recommended that triglyceride levels should be even lower (closer to one milligram per deciliter) to minimise cardiovascular disease risk. The problem is, however, that recent trials (Alpha Omega) and (ORIGIN) have cast some doubt on the ability of fish oils to provide cardiovascular benefit. A paper recently published by our research group has shown that supplementing the diets of obese men with fish oils significantly lowered blood triglycerides, but only when given at four times the dose that is normally recommended (4g per day rather than 1g). The study, which included 24 men, investigated the mechanisms by which fish oils act. It was not designed to assess of cardiovascular benefit. We also showed that the way fish oils worked was to lower the amount of triglycerides that were produced by the liver. This finding is valuable in demonstrating the importance of an effective dose when assessing the clinical effects of diet on disease. A more extensive trial of the effect of fish oils in cardiovascular disease prevention (REDUCE-IT) is testing exactly this with 4g a day of the active ingredient of fish oil in 8,000 patients with elevated triglycerides. The results of this trial will be known in 2016. Whatever the outcome of further trials, there is more than enough evidence to suggest that taking fish oil supplements for a range of conditions (including inflammatory conditions such as arthritis) is worth it, if taken at the right dose. The consumption of fatty fish, full of the active ingredient of fish oil, omega-3 fatty acids, also provide benefits, albeit to a lesser extent. Examples of oily fish include small forage fish, such as sardines, herrings and anchovies, as well as larger fish such as salmon, mackerel and trout. Eating a 150g serving of cold-water fish, such as salmon, sardines, and herring, some of the species most enriched in marine polyunsaturates, is equivalent to around 2g to 3g of omega-3 fatty acids. But the same can not be said of red meat consumption. A study published this week in Nature Medicine demonstrated the important role of bacteria in the gut in the conversion of L-carnitine, a chemical found in high concentrations in red meat, to a compound, trimethylamine-N-oxide, that accelerates the progression of atherosclerosis (clogging of the artery walls) in mice. 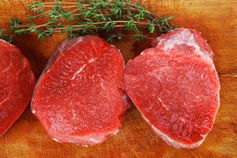 This study is interesting because it highlights a possible reason why red meat may not be good for you. Prior to this study, it was commonly thought that the problem was in the fats contained in meat. Another interesting aspect of this study is that it demonstrated that bacteria in the gut, the so-called microbiome, can be responsible for affecting levels of chemicals in the blood. Unlike red meat, the concentration of L-carnitine in fish is about ten times lower. So favouring fish over red meat would leave your intestines with less carnitine for your intestine to convert into an artery-clogging compound. While the red meat story has captured the headlines, clearly more research is needed to fully understand the pathways linking red meat, L-carnitine and gut microbiota to cardiovascular disease. For fish oils, high doses are better able to lower triglycerides, and doses of up to 4g a day are currently recommended for patients with elevated triglycerides. In terms of their benefit in treating cardiovascular disease, we await the outcomes of new clinical trials. For now, it’s best to follow the Australian dietary guidelines, which recommend limiting red meat consumption to 455g a week and increasing fish consumption to two or three serves per week. Hugh Barrett is Professor in Systems Biology at the University of Western Australia. This article was originally published at The Conversation.